Welcome to the Barony of Naevehjem! We are a branch of the Society for Creative Anachronism, Inc. (SCA) in the Kingdom of Caid. The SCA is an educational society that attempts to recreate the middle ages – minus all the bad parts like plagues, inquisitions, and indifferent personal hygiene. The Society is divided into kingdoms and the kingdoms are subdivided into smaller areas, such as baronies and shires, based on geographical location. There are principalities, strongholds, colleges, marches, ridings, etc., etc. in the SCA, too. Naevehjem is a barony within the kingdom of Caid (the kingdom encompasses Southern California, southern Nevada, and Hawaii). The Barony is centered around Ridgecrest – a desert community about 150 miles North of Los Angeles. Within our borders lies the Owens Valley; the barony stretches north from California City up, between the Sierra Crest and the Nevada border, to Tom’s Place near the Mammoth Lakes area. In these pages, we will introduce you to the officers in our barony, tell you about the events we sponsor throughout the year and provide a calendar of meetings. If you dig deeper, you will find points of contact for various arts and sciences guilds, warcraft leaders and others who will be happy to help you. You can get a glimpse of the kinds of awards we bestow and maybe find some pictures, too. More information about the Kingdom of Caid can be found at the Kingdom’s website. 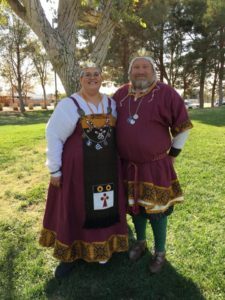 If, after you’ve looked at all we have to offer, you think you might want to get involved in the SCA, you can send in a membership application by going to the Society for Creative Anachronism, Inc. (SCA), then clicking on the Membership button. If you would like more information and would like to play in our barony, please contact our Chatelaine, who will be more than happy to help you get started.